As much as possible, provide your employees with an environment that is conducive to their creativity. Some people perform best when allowed to work on their own, while others need the stimulation that comes from being part of a group. Observe your employees and note when they do their best work. Creative people can sometimes be prone to flightiness. Provide enough structure to keep your creative employees on track and on schedule. Let them know when it is time to complete the task and move on to something new. Remember that creative employees need downtime to recharge. Make sure your employees are given time and room to think, explore, question, even play. An atmosphere of constant crisis will not help creative ideas to flourish. As the boss, your behavior sets the tone of the workplace for everyone else. Left to themselves, many creative people will neglect the less interesting, routine aspects of their work. But such tasks are important, too work must be documented in reports, paperwork must be completed, customers must be attended to. If your business is to function, that are boring routine work must get done. Therefore, while you should be flexible with your employees, you must also insist that they not neglect the less exciting aspects of their job. At the same time, creative people need to spend time working without being micromanaged. Yes, reports are important but so is trust in the process. This means allowing them the freedom to spend time developing wild, off-the-wall ideas without having to constantly report on their progress. Some creative work must be sheltered from the cold light of day, especially when ideas are incomplete and untested. This allows creativity to blossom. Communication with your employees is crucial if you want them to turn their natural skills to solving your real business problems. Provide your employees with information and direction so that they grasp the big picture rather than becoming obsessed with the smaller details. Define a real problem your organization is facing and turn them loose the results may surprise you. 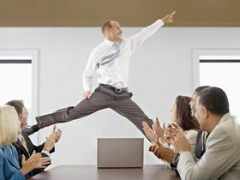 Provide reinforcement and support for your creative employees. It may appear that employees who are engaged in creative work have all the reward they need from the work they do, but in fact they need support as much as anyone else. Avoid taking creative people for granted. These workers are no different from your other employees everyone needs praise and recognition for work well done. Make sure that every employee has the opportunity to contribute, to feel challenged and motivated. Ask all of your employees for their input and suggestions. Employees want the respect of their peers; peer recognition and the power of the team are great motivators. Find ways to ensure that your workers can earn the respect of their peers, and if necessary employ group pressure to hold them accountable for their work. Make certain that peoples productivity is measured in terms of more meaningful criteria than mere hours spent working. As much as possible, creative people should have the freedom to work on their own terms and on their own schedule. (Some companies even allow employees to spend a percentage of their work hours on their own personal projects.) Allow them to be responsible. This does not mean there is no accountability, but the accountability is not necessarily measured in hours hunched over a desk. Rather, the accountability is seen in quantifiable results that brilliant new idea, amazing new design, or anything else they can dream up. Posted in General Management Jobs by vimonmass on September 15, 2014 .